The God We Worship: An Exploration of Liturgical Theology, by Nicholas Wolterstorff. Grand Rapids: Eerdmans, 2015. 180 pp. $20.00. Nicholas Wolterstorff endeavors to do something that has been almost unprecedented, that is, discovering what is understood but not stated about the God we worship by examining closely the liturgy of the Church. Throughout the course of The God We Worship: An Exploration of Liturgical Theology, Wolterstorff examines in detail the liturgies of the Orthodox, Catholic, Episcopal, Lutheran, and Reformed churches largely due to the fact that these liturgies have long withstood the “tests of time” and have a “depth, a richness, [and] a beauty” that he feels is lacking in contemporary alternative liturgies (20). Wolterstorff argues that there is a reason we do what we do in worship and, rather than focusing always on what is explicit, he directs his attention to the underlying understanding of God implicit in worship as what can form or deform the congregation’s explicit understanding of God. Wolterstorff is a distinguished author, professor, and a modern authority in the field of liturgical and theological studies. This book is a revision of the texts of the Kantzer Lectures in Revealed Theology he gave at Trinity Evangelical Divinity School in 2013 (xi). 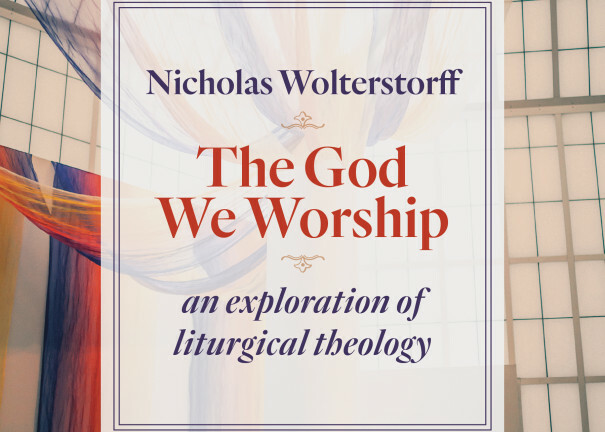 Wolterstorff structures his argument into nine chapters, with each chapter examining a different aspect of the liturgy to find what is implicit about God in the acts of worship. In the first chapter, Wolterstorff outlines what a Christian liturgy entails, as well as how one should go about understanding God implicit in the liturgies. He states that Christian theology revolves only around “the God Christians worship” (2). He goes on to describe what will be the focus of his project, liturgical theology; Wolterstorff claims that he will in the course of the following 178 pages “[make] explicit the understanding of God implicit in Christian worship,” while supporting this claim by clearly articulating this understanding—explaining, developing, and defending it (2). This first chapter lays the foundation on which Wolterstorff will build his arguments of God implicit in the liturgy in the chapters that follow. Chapters two, three, and four outline the arguments for God found implicit in the liturgy as One who is worthy of worship (ch. 2), One who is vulnerable (ch. 3), and One who participates in mutual address (ch. 4). Chapters five, six, and seven focus on the understanding of God implicit in our addressing God in the liturgy. In chapter six, Wolterstorff takes time to carefully describe the process in which we can know that God listens through a discussion on the usage of analogous extension in describing the qualities of God. He later transitions into the understanding of God as one who speaks in chapter eight, while interacting with different views of God’s revelation from John Calvin and Karl Barth. In the final chapter of the book, Wolterstorff focuses heavily on the understanding of God implicit in the Eucharist (ch. 9), expounding greatly upon the Eucharist by unfolding the statement, “Christ offers himself, and we partake” (150). Wolterstorff appends an afterword explaining the significance of developing a liturgical theology. Wolterstorff clearly articulates that which is not easy to grasp, perhaps most notably through the repetitious nature of his writing; Wolterstorff continuously revisits previously discussed ideas to further establish the foundation upon which he will build with the introduction of new material. Much of what returns in his writing are the definitions upon which he elaborates to support his argument. Wolterstorff uses an entire chapter to discuss what he means by “making explicit the understanding of God implicit in Christian worship,” which is obviously most important to reference frequently in the following chapters in order to fully examine this definition (2). Wolterstorff also regularly uses examples from the different liturgies to which he is referring to fully survey the examples of God implicit in each respective liturgy. What proved to be most beneficial in supporting his argument of what is implicit in our understanding of God as a listener was his detailed discussion of analogous extension. He supports the argument in which he states God can in fact listen to our prayers (as well as speak to us) by giving numerous examples of analogous extension and demonstrating how it can be applied to God (106). Although Wolterstorff is an excellent wordsmith, he does not mince his words when referring to contemporary liturgies; however, he is very faithful to explain why he regards these liturgies (bare as they may be) as lesser forms of liturgy. Also, although Wolterstorff never stated that he intended this book to be a practical source, as a reader I thought that at least the inclusion of an appendix of discussion points would be beneficial to one who does in fact want to reform his church’s liturgy to reflect the understanding of God implicit that he gained from reading this book. That subject, however, may necessitate another volume. Some would probably argue that this book addresses more of the theological side of worship rather than practical applications of this idea to modern worship; however, Wolterstorff states that when a body of Christians comes together, its worship will most always “take the form of liturgical worship” (9). The Greek word for liturgy (leitourgia) means simply “the work of the people.” Therefore, if these two statements taken together are true, this book is full of application as to how the worshiper can rightly understand the crossroads of theology and its practice in the liturgy. With that, I believe this book would be highly beneficial for any reader who seeks to understand what is implicit in our worship actions, especially regarding the God we worship. This book is recommended for all Christian worshipers, as it is vitally important that we understand what we are implying in the gifts of worship we offer to God.